Mental health issues are a serious problem for U.S. Armed Forces and for the Air Force. These illnesses are often not visible to others, making them difficult to diagnose and leading to unnecessary suffering. By implementing yearly screenings, more Airmen in the early stages of mental illness will be identified and referred for treatment, helping them heal and improving overall medical readiness. 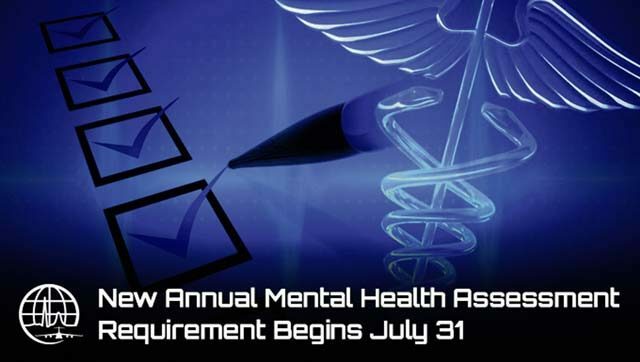 The annual MHA fulfills a requirement of the Fiscal Year 2015 National Defense Authorization Act and uses established Department of Defense questions for early detection of mental health issues. The questions included in the MHA are the same that Airmen see on their pre- and post-deployment health screenings. Completing the annual MHA can even substitute for specific post-deployment screenings. Airmen will continue to fill out the DD form 3024 online for their annual PHA, which already includes the mental health questions. Airmen will speak with a trained healthcare provider or licensed mental health professional to complete the person-to-person component. Most flight personnel will meet face to face and most nonflight personnel will complete this section over the phone. Members of the Air National Guard and Air Force Reserve will begin the annual MHA later in August. For Airmen stationed at bases with medical treatment facilities belonging to other services, efforts are underway to ensure transfer of PHA questionnaires between the services. Until this process is complete, the Air Force will utilize existing Base Operational Medical Clinic protocols to accomplish these PHAs. Airmen who underwent a PHA in 2017 prior to Monday do not have an additional requirement to retake it this year. Their 2018 PHA will include the MHA interview with a medical provider.